If the thought of going through a job interview gives you the chills and makes you nervous, rest assured, it does not have to be that way. With some preparation and planning, you can ace your next interview and land your dream marketing job. Before your interview, do some research on the company and your interviewer. Check out his or her social media and the news section of the company website to find out about any recent achievements, new campaigns, or major issues. Having some background information will help you impress your interviewer and give you a solid foundation for your thoughts during the conversation. In addition, it will be much easier for you to come up with a few questions when the interviewer asks if there is anything you’d like to know about the job or the company. 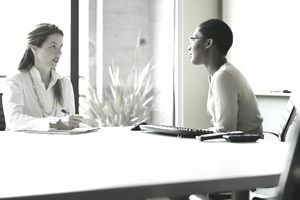 Plus, there’s always a chance that you could find something you have in common with the interviewer that will help form a bit of a personal relationship – having some sort of personal touch is a great way to help the interviewer keep you in mind when the interview is over. Make sure you bring copies of your resume and samples of your writing or other work. You'd be surprised by how many candidates do not bother to share a portfolio but doing so highlights both your excellent work and your thoroughness. Be prepared to talk through two or three main examples of your work, such as a blog post you wrote that went viral or a social media campaign you did for a local non-profit organization. Offer plenty of details about why you chose the topic or components of the campaign. In addition, it’s important to make a professional impression your interviewer. While you may be tempted to show some creative flair when dressing for an interview, don't go too crazy. Marketing interviews still typically require a suit. You can show some color with a tie or blouse but save the funky and edgy stuff for when you're hired and get a better idea of the company culture. Tell me about a marketing project in which you had to coordinate and manage a diverse team of people to achieve deliverables. Give me an example of a marketing campaign (either your own or someone else's) that you consider to have been very successful. Tell me about a campaign with which you were involved that did not go as well as expected. What do you think went wrong? What do you consider the 5 most important aspects of successful marketing? Tell me about a time when you successfully changed a customer's mind. Give an example of a time when you accomplished a marketing activity on a tight budget. How have you successfully incorporated online marketing tools into your previous marketing campaigns? How familiar are you with our target market? What marketing strategies would you consider using for our product? Having a job in the marketing field can be fun and rewarding. It’s a career that often involves a combination of creativity and the ability to communicate well to an audience. In the past, most marketing jobs involved print advertising, phone calls or television and radio ads. But the growth of the internet and social media have brought about the need for many new marketing jobs. Research marketing job titles and descriptions to see what types of marketing jobs may be the best fit for your abilities and interests. Of course, all these tips for acing your interview are only going to help if you get invited to an interview in the first place. In order to do that, your resume is going to need to get noticed and one way to do that is to list your marketing skills in a special profile. Having a skills profile will allow humans or computers to spot the keywords that tell them that you may be a great candidate for the job. Some of the skills you may want to list include communication, public speaking, thinking style, creativity, ability to negotiate, stress management, and your knowledge of technology.